This help page should cover all features of release 2011-05-21. WolfR4 is a launcher / patcher tool for Acclaim's Re-Volt (version 1207). Notice: the Patch 1207 has to be applied to Re-Volt before you can use WolfR4. Demo, non-patched (ie. v1.0) or 0916 patched version of Re-Volt are not supported, and will never be. Fixes a lot of Re-Volt bugs. Provides an easy access to the most commonly used options in Re-Volt (Number of laps, Activate Pickup...). Extends some existing Re-Volt features (up to 12 players in online lobby race, increase the Battle Tag time...). Adds new options / features not available in Re-Volt (Ghost car in Time trial, Race against 30 AI opponents, No car/car collision mode...). Provides an easy access to all Re-Volt command line options. Allows to use a default profile when playing offline and another profile when racing online (automatically activated when using RVHouse). Comes with some useful functions to manage users tracks (Packer, Renamer, Uninstaller, etc.). Allows Custom tracks (more elaborated user tracks, as track makers can customize more things than in usual user tracks). Allows the user tracks that are designed for to be raced in reverse mode. Allows to add user Stunt tracks and user Battle Tag tracks (without overwriting any of the stock stunt and battle tracks). Allows to create user cars that behave like the UFO (flying) or the Panga cars (rotating head). 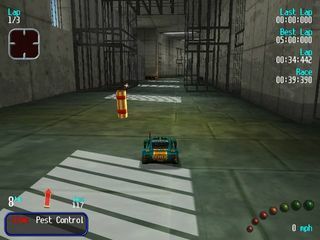 Track or car included by default in the original Re-Volt. Track or car added by the user. User track that comes with a "custom.ini" file. A "custom.ini" file that remains loaded as long as Re-Volt is running. An application that launches Re-Volt to play online using DirectPlay Lobby (eg. RVHouse). This project really started in the beginning of 2010, but was the logical continuation of several Re-Volt patches I was already working on by this time. 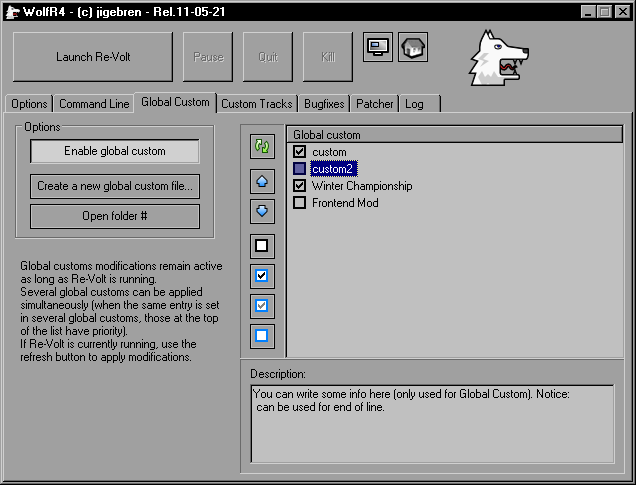 The first WolfR4 version to allow custom tracks has been released in February 2010, and was first distributed as a closed Beta to all people who asked for it via ORP forum. Then soon, and thanks to the help of Beta-testers (ie. Urnemanden, Antimorph, Arto, then Huki, and all others of course...), the project quickly evolved, and in July 2010, it was considered advanced and stable enough to be released publicly (first public release: 2010/07/28). In October 2010, less than a year later, I think I have met my main objective: pushing the original revolt.exe to its max, making it more stable and giving more creative freedom to car makers and track makers. Just a note about the future plan. Now, a new promising project has arisen that you might be interested to look at: the Re-Volt v1.2 project. We're directly supplying a new executable compiled from the source, which give us far more latitude to fix bug or implement new feature than binary patching... At the time of writing, a lot of WolfR4 features are not ported yet to v1.2, but most of them should be added eventually, if we can find the time (of course not the management features like Track Packer / Unistaller, etc.). To make it short, the custom support is currently quite nonexistent in v1.2, but several points like eg. the online support have been greatly improved. 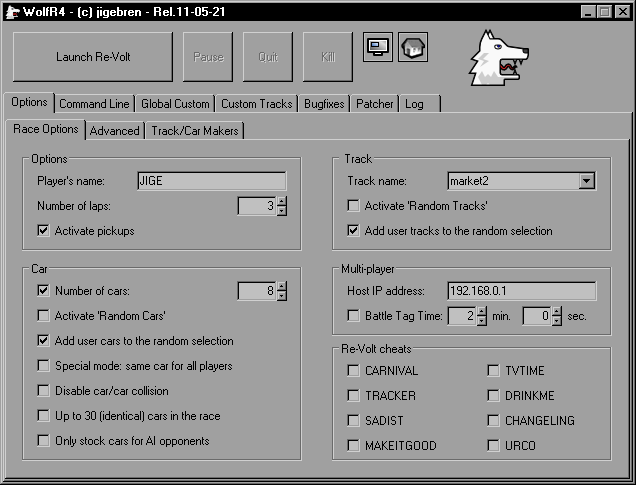 Here is a screenshot of WolfR4, showing the Custom Tracks tab. WolfR4 now supports quite a large amount of features, but each option can be actived/deactivated from the interface. For example, you could only use the patches without activating the custom track support, or just use it as a friendly interface for all Re-Volt command line options. All available options are described here. The layout of this help page tends to follow the WolfR4's interface layout. These command-line switches can be used to modify WolfR4's behavior. For example, they can be used to quickly launch a completely different profile (different patches applied, different settings). Automatically launch Re-Volt when WolfR4 is started (no need to click on the "Launch Re-Volt" button). Automatically close WolfR4 when Re-Volt ends. Use the online profile by default. Select the revolt.exe file to run (like the "Re-Volt filename:" entry in the "Command Line" tab). Select another settings file than default 'WolfR4.ini'. C:\Games\Re-Volt\WolfR4.exe /autolaunch /ini "another profile.ini"
The following keyboards shortcuts are enabled when WolfR4 is running. They are registered as global shortcuts, which means that they remain active even when WolfR4 is not the focused window. That way, they can also be used when playing Re-Volt. Keep in mind that they also remain active if you're working on any other application (only as long as WolfR4 is running of course). If for any reason (eg. in case of shortcut conflict with another applications), you need to deactivate these shortcuts, just set the "activate_hotkey" key to "false" in the first section of the WolfR4.ini file. Only seen when WolfR4 is launched from a lobby client. If you want to modify some settings in WolfR4 before Re-Volt gets automatically launched. Note that auto-launching can also be canceled by clicking on any other entry in the interface. Pauses the Re-Volt process (totally frees the cpu usage). Quite similar to the "Kill" button, but a lot safer as it asks Re-Volt to quit, instead of simply killing the process (thus allowing Re-Volt to properly save its settings, etc.). Immediately kills the Re-Volt process. Not recommended, unless Re-Volt is not responding. Select whether Re-Volt will be launched fullscreen or windowed. This button is just a shortcut to quickly switch between the Fullscreen and Windowed options in the "Command line" tab. Use online profile (colored icon), or regular profile (grayed out icon). Most options here are patches that directly modify Re-Volt in memory at runtime. Some settings can still be modified while Re-Volt is running, whereas others can only be set before Re-Volt is launched (they should be automatically grayed-out when Re-Volt is launched). Some options are just time saving shortcuts to modify usual Re-Volt settings (in registry). These settings obviously can't be modified while Re-Volt is running, as the registry content is read only once at Re-Volt start up. Sets the number of laps needed to complete a race. Allows pickups (bonuses) during race. If option "Allow single car race" is active, then (min = 1). If option "Up to 30 (identical) cars in the race" is active, then (max = 30). Sets the number of cars/racers (otherwise this value is always reset to 8 at Re-Volt startup). This option is half a patch, half a Re-Volt registry setting (because Re-Volt saves this setting when quiting but does not read it at startup): When launching Re-Volt, this value is patched into memory. When Re-Volt quits, the value is read in the registry, so that any modification done in the Re-Volt frontend gets updated in WolfR4. This setting is not saved by Re-Volt (so it is always deactivated at Re-Volt startup). With this option, "Random Cars" mode gets activated by default. This option will also make the "Random Cars" mode usable in online racing when using a lobby launcher, like eg. RVHouse (otherwise it is not possible to use Random Cars mode online AFAIK). Allows user cars to be picked in "Random Cars" mode (usually, only stock cars are selected). Avoid to use this option when hosting an online race with "Random Car" mode active if you're not sure that all other players have also installed all the users cars you own. Replaces the "Random Cars" mode by a special mode where all AI opponents will use the same car as the player (like in Random mode). This mode is only active when the "Random Cars" option is enabled in Re-Volt. Enable racing without collision with other players (like in TrackMania). Notice: Your name has to begin with C! to activate it, like for example: C!MIKE (that way, nobody can use this option secretly). This option allows to have up to 30 cars at the same time in a race. For the reasons explained below, all the racers use the same car model. Notice: This carnage mode can only be used in offline single race mode (it can't work online). Re-volt is only designed to use 12 different cars at the same time, except in the ClockWork Carnage mode where 30 cars are used. This is allowed by using the same model for all cars, thus sharing one single texture file for the 30 cars (only each car color is modified to simulate difference). This patch is roughly using the same principle to allow up to 30 cars. Prevents AI (Artificial Intelligence) opponents from selecting user cars. 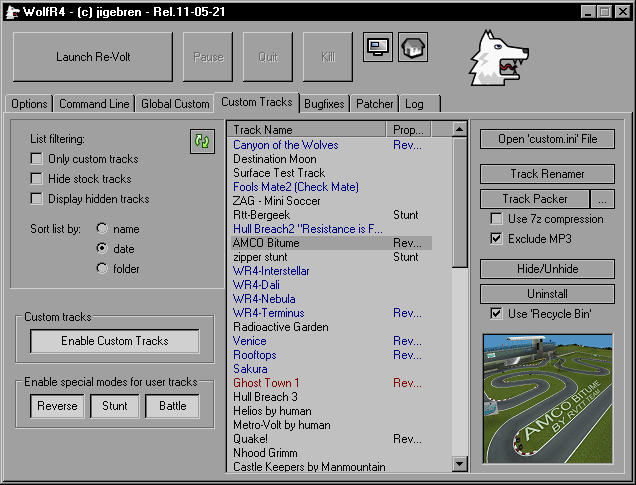 Set the track used at Re-Volt startup (can be selected in the list of all installed tracks). The track's short name (ie. the name of the track folder) is used, not the real track name. Notice that you can also double-click in the tracks list (in the Tracks tab) to directly launch a track in Re-Volt. This setting is not saved by Re-Volt (so it is always deactivated at Re-Volt startup). Use this option to get "Random Tracks" mode activated by default at Re-Volt startup. This option will also make the "Random Tracks" mode usable in online racing when using a lobby launcher, like eg. RVHouse (otherwise it is not possible to use this mode online AFAIK). Allows user tracks to be picked in "Random Tracks" mode (usually, only stock tracks are selected). Only the first 107 user tracks will be included in the track lottery. Avoid to use this option when hosting an online race with "Random Tracks" mode active if you're not sure that all the clients also have all your tracks available. Edit the host IP address (could be a host name, or an IP address in the form: 123.46.159.87). Modify the time needed to complete a battle in Battle Tag mode. All players have to use the same value, otherwise the displayed timer will be inconsistent. All these cheats are normally only available in Re-Volt by entering a special player name. Gives any weapon to the player using the [RightShift] key. Enables the in-game editor. Used by track makers when creating a new track. Enables F5 and F6 cameras during race. Change the player's car during race using [PageUp] and [PageDown] keys. Unlock the UFO (flying) car. Press the [Space], [Enter] or [Esc] key during the intro to go straight to Re-Volt loading (instead of skipping intro images one by one, and without any forced delay on the 1st image). The "Select Language" menu will be called each time Re-Volt is launched. It was the default Re-Volt behavior in initial Re-Volt version, maybe v1.0. 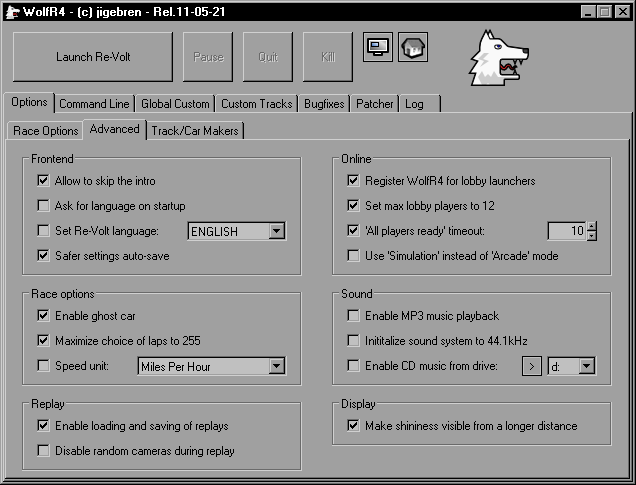 Instead of activating the "Select Language" menu with the above option, you can rather force Re-Volt to use the specified language directly from WolfR4. Using this option should force the selected language even during an online Lobby session (usually, English is always used in lobby sessions). Usually, Re-Volt only saves its settings when quiting. If it crashes in the middle of a game, or if it is closed with Alt+F4 (or Ctrl+F12), all recent settings modifications are lost. This option force Re-Volt to save its settings each time a track is loaded or restarted, and when going back to frontend. Enjoy the ghost car in time trial mode. Allows one to set more than 20 laps in the Re-Volt frontend. The speed unit displayed during a race can be set in the frontend but is never saved by Re-Volt when quitting. At each startup, MPH is used by default. This option allows to set another default unit, for example KPH. Re-Volt allows the use of 1/10 scaled speed units, which means that the displayed speed will increase tenfold. Self explanatory. The 'Replay.rpl' file is placed in the main Re-Volt directory. Notice: Only one single replay slot file is available. The camera is only modified by pressing the F1 key to switch between the 3 car cameras (mimicks in-race behavior). If the TVTIME cheat is enabled, you can also use the F5 key to select the Replay cameras. 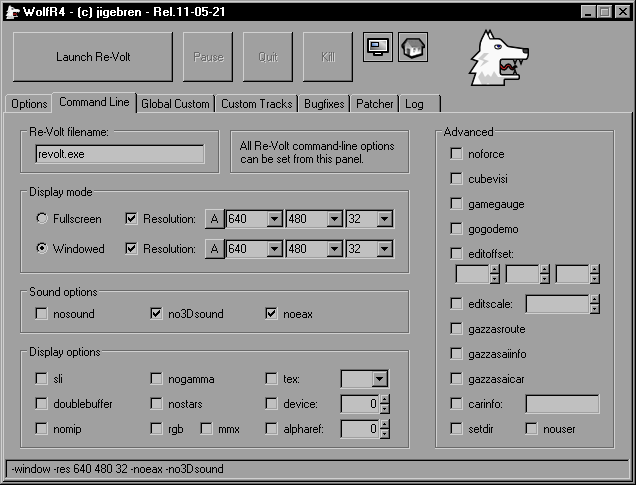 Allow the use of WolfR4 with any program that calls Re-Volt using DirectPlay Lobby, like for example RVHouse, and probably any other lobby client too. There is nothing to configure in RVHouse itself. Once WolfR4 is registered, it will be automatically launched by RVHouse (in place of Re-Volt) and will then be in charge of loading Re-Volt. When launched by a lobby client, WolfR4 will wait for ~3 seconds before automatically launching Re-Volt. During this timeout, the auto-launching process can be postponed, to let the user the possibility to modify some settings in WolfR4. If Re-Volt has already been run at least once, just activating the option in WolfR4 should be enough to register it. Otherwise, the best way to be sure that it will work properly is to activate this option, then launch and quit Re-Volt once (from WolfR4) before using RVHouse. Don't rename the WolfR4.exe file, otherwise it will not be able to register itself as a launcher. To postpone the auto-launching process, you can click on the "Cancel auto-launching" button, or on any other button/option in the WolfR4 interface. When playing online with a lobby launcher (like RVHouse), Re-Volt only allows a maximum of 8 players to race together. With this patch, up to 12 players can now join the race. This set the "all player ready" timeout. The "all player ready" timeout sometime occurs at the launching of an online race when Re-Volt thinks that all players are not ready yet. Usually, the game mode can't be chosen in online race, and default 'Arcade' mode is always used. This option allows to use 'Simulation' mode instead. Please notice that it modifies only the local player's mode, and it not possible to know the mode used by other racers. Plays MP3 audio called by levels (quite each stock track has an MP3 entry in the .inf file that can be played during race). The "Mp3dec.asi" file is needed. This file can be found in any demo version of Re-Volt (or downloaded from here). The MP3 files for the stock tracks have to be placed in the Re-Volt directory. Notice: MP3 playing is disabled when 3D sounds are on. Don't forget to disable 3D sounds if you want to use MP3. Initialize the sound system to 44kHz (instead of 22kHz) for hi-fi MP3 playing. Prevents quality degradation due to downsampling the MP3 files to 22kHz. The frontend's menu sounds also benefit from this setting. Re-enable Redbook (music playback from Re-Volt CD) like in Re-Volt versions prior to the Patch 1207. You have to set the Re-Volt's CDROM drive letter, and of course keep the Re-Volt CD in the tray. You can click on the [>] button to automatically detect the Re-Volt's CDROM drive letter. Usually, shining surfaces quickly get deactivated as you move away from them (for example, it can easily be noticed by looking at the bottles in "Supermarket 2" track while moving towards them). This option will double the ENV range, so that shininess will be visible form a longer distance, making the transition less noticeable. Content of this tab should not be useful for simple racers. But as soon as you start to create/mod cars or tracks, it may contains worthwhile options. Reload all cars' parameters.txt files while Re-Volt is running. This can be very useful for car makers when tweaking a car's parameters. Important: Without the CHANGELING cheat, a race restart is needed to actually see the modifications. If the CHANGELING cheat is activated (from the WolfR4's interface), the player's car will be updated automatically in the race (as if you had pressed [PageUp] then [PageDown] to load another car then reload the 1st car). Do not use this option at the very begining of the game, when the frontend is not even launched, as Re-Volt will probably crash. Notice also that Re-Volt could crash occasionally when using this feature repeatedly with the CHANGELING cheat activated. It does not allow to add / remove user cars on the fly. This feature only works on Win2K and later. Allows one to play a race with a single car, no opponents (can be necessary when editing a track as, for example, opponent cars can crash revolt when editing an incomplete AI nodes line). Pauses on car preview in frontend. Car makers can use it for an easy car screenshot. This option modifies the behavior of follow-car camera (the default one in race) and in-car camera (when the F1 key has been pressed twice), mostly when using vehicles with a very low CoM (Center of Mass), like eg. bikes. Follow-car-camera should not point downward anymore. Usually, the in-car camera position is relative to the center of mass (CoM) of the car with a constant vertical offset. This option modifies the in-car-camera height to stick to the top of the car's CHull (ie. the collision data in the .hul file) instead of following the CoM. It should be more respectfull of the actual shape of the vehicle. Of course the CHull has to be properly placed and scaled to fit the shape of the car (and it's not always the case with user cars...). The X and Z values of in-car camera position are left unmodified, and should still be relative to the CoM. With this option, the racer's car will still be drawn when using the in-car camera mode. - We can't set precisely the position of the camera. - When the camera is inside the car, several polies are seen from behind, and as they are not double-faced they just look fully transparent. - As we're getting very close to the car body, we can reach the "near clipping" limit used when rendering polies (this limit could be reduced, but it doesn't give better result in all cases). And last, don't forget that the above option "Improve cameras behavior for low-CoM vehicles" can have a significant influence on the result (as it modifies the in-car camera position). Allow car makers to create vehicles behaving like the UFO (still handleable when flying) or the Panga (rotating panda's head). Just add a spinner to the car and set the "AngVel" to be "0.000000" (in the parameters.txt file). The car spinner will behave like for the Panga car (the spinner rotation is controlled by steering, and its height is modified when accelerating or braking). Notice: In that case, the engine sound can only be "Glow". Notice: As these parameters are already used by the original Panga car and UFO, no modification is needed for these cars. In cars' parameters.txt files, ResMod is usually set to 25 to prevent cars from spinning too easily when in the air, but for expert racers, it could be perceived as giving a driving-in-syrup effect. This option is equivalent to setting 'ResMod = 1' for all cars, thus adding an ultra-realistic touch to races (a sort of even more cutting edge game mode than 'Simulation'). This setting was mostly touted by CityWalker, so I will quote her advice about it: Take your time with the ResMod 1.0 stuff. It’s really quite different and does need some practice on more complex tracks. But IMO, the added realism is a worthy reward. Swap forwards / backwards and up / down action for keyboard and mouse when modifying camera position in Edit mode. This layout could be more natural for players who are used to FPS (first person shooter) layout. Display main camera position as well as looking direction during race. 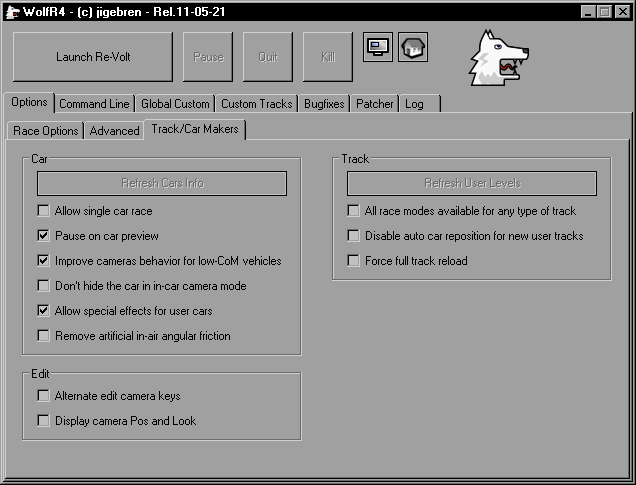 Allows one to add and remove tracks whilst Re-Volt is running (also refreshes tracks info in WolfR4). Designed for the same goal than the "Allow single car race" option, this quite powerfull option will make all levels (stock and user tracks) selectable in any racing mode. It means that for example Time Trial mode will be available for user tracks, which can not only be fun, but can also be useful for track makers to edit AI nodes without the disturbing opponent cars. Prevents the cars from being constantly repositioned when no track zones (in .taz file) have been created yet (eg. when creating a new user track). Ensure all the track's files are read again with a simple 'restart track'. Normally, when a track maker is editing a track with Re-Volt running at the same time, he has to quit to the frontend before reloading the track to actually update the track content in the game. With this setting on, a simple track restart should be enough to update all the track's files. Keep in mind that the settings here are usually not saved / restored when quitting / restarting WolfR4. Allows to modify the Re-Volt version. It can thus give access to the DEV version features. Allows to skip World, Instances, Objects, HUD (control panel) or SemiTransparent rendering. This setting is saved / restored. Allows user cars to behave like the Rotor (drivable upside-down) when CLASS = 4 (in the parameters.txt file) or the Mystery car (smooth mesh) when CLASS = 5. It's similar to the Panga/UFO effects option, but it's unsupported as it is a bit less easy to implement, and probably less needed. This option can also be activated in the WolfR4.ini file, by setting the "allow_special_car_effects2" key to "1". The car can still be drivable normally whe upside-down (if the wheels are big enough of course). It is activated by setting the "class" entry to "5" in the car's parameters.txt file. The original Rotor car will lose its rotor effect, so the CLASS in its parameters.txt will have to be updated. The engine sound will be "glow". The car mesh can be smooth, when the smooth property is set for some polygons (I don't know if there is currently a car editor able to do that). It is activated by setting the "class" entry to "4" in the car's parameters.txt file. The original Mystery car will lose its mystery effect, so the CLASS in its parameters.txt will have to be updated. All Re-Volt command-line switches are directly available in this panel. This setting is used by the file Patcher as well. Forces fullscreen mode's resolution to desired width (pixels), height (pixels), and color depth (bits). The 3 fields are required! Automatically uses the current desktop width, height and depth. Run Re-Volt inside a window. Forces windowed mode's resolution to desired width (pixels), height (pixels), and color depth (bits). The 3 fields are required! Automatically uses the current desktop width, height and depth. Width and height are both halved. This option is needed to enable MP3 music playback. This setting is activated by default for Vista and later. Modifies the display buffer flip method during level loading (in fullscreen only). This option is needed under Vista and Win7 to fix the can't flip display buffers error. Disables Museum 2's stars that cause problems with some 3D cards. Forces draw device (set the device index). Uses software-emulation RGB device for rendering (instead of the default Direct3D HAL device). Sets the alpha reference (ie. the texture tranparency threshold). Disables testing of each polygon against the VisiBox when a Cube is only partially inside the VisiBox. Game gauge, creates the file 'FPS.txt' in Re-Volt's directory. Go straight into the DEMO mode. Edit objects' offset (X, Y, Z) in Edit mode. Edit objects' position scale in Edit mode. Sets the CarInfo.txt filename (deprecated). Set current directory to executable's directory. Disables loading of tracks of whose name begins with "user" (i.e. tracks created in the Level Editor). Custom feature is a way to patch Re-Volt directly in memory while running (no definitive modification is made), to allow the modification of a lot of parameters which were usually not designed to be accessible to end user. For example, a user model can be used in a track instead of a stock model (which is normally impossible) by temporarilly modifying the path to the stock model. Some inaccessible values like the train velocity can also be tweaked. All custom modifications are done in memory at runtime only, not a single file is modified by the WolfR4 custom feature. As soon as you quit, Re-Volt is back to an clean unmodified state. Even in case of crash, your files can't be messed up. Custom possibilities are managed in WolfR4 by the mean of configuration files: the Custom.ini files. The global custom modifications are applied as soon as Re-Volt is launched, and remain applied as long as Re-volt is running. The track custom modifications are applied only when the corresponding track is loaded, and only as long as the track remains loaded (modifications are removed when another track is loaded or when going back to frontend). Global and track custom are of course compatible, and can be used simultaneously. Global custom being applied first, it can be temporarilly overwritten when playing by a track custom. When the custom track is unloaded, the previous values are restored. All global custom files have to be placed in a folder named "#" inside the main Re-Volt directory. You should give them a descriptive name, but the extension has to remain ".ini". Each track custom file has to placed in the corresponding track's folder (ie. inside "levels\track_folder\"). It have to be named "custom.ini". Allows to replace stock models by user models. Allows to replace each stock track by an user track. Allows to replace each stock car by an user car. Each car's shadow data can be tweaked too. Allows to create custom championship. The number of tracks per cup (from 1 to 5), the tracks used, the number of laps for each track, and the mirrored and reversed state can be modified. To know all the potential custom features supported by WolfR4, I suggest that you look directly at the self-documented custom.ini file. If you're a bit used to Re-Volt track making, everything should be quite easily understandable. You can also take a look at this custom track example. The global custom modification are applied as soon as Re-Volt is launched, and remain applied as long as Re-volt is running. To set up a complete Re-Volt mod (eg. something like the Artic Blast project). To create custom championships (each stock track can be replaced by an user track). Maybe you know the Toyeca patch, where all stock cars have been replaced by toyecas. This kind of car pack could be done on the fly with the help of global custom. It could also be used just to provide a new frontend, or to replace the HUD items or the menu frames, etc. To modify textures size, like the Patch 512, with less complete but in fact more advanced possibilities. Enable/disable WolfR4 global custom support. Create a new default global cutom ini file in the '#' directory. Open the '#' directory, where the global custom files have to be placed. Select the global custom files to use (several global customs can be activated simultaneously: only the one ticked in the list will be applied to Re-Volt). When the same entry is used in several global custom files, the global custom at the top of the list have priority. After having modifed (and saved) a global custom ini file, refresh the list so that the content of the file is read again by WolfR4. If Re-Volt is currently running, it will be updated as well. You can activate or deactivate a global custom when Re-Volt is running, but you have to use the Refresh button to actually apply the modifcation. Reloads the list and the content of all global custom files. Updates the custom modification in memory if Re-Volt is running. Several command are accessible when right-clicking on the global custom list. Opens the global custom .ini file in the associated application. Allows to rename a global custom. Will reduce the .ini file to the to the minimum needed, by removing all unused (ie. commented) lines and all empty sections. It can be used for example before distributing the global custom file. The 1st header (between the 2 "----...----" lines) is preserved. All other commented lines are definitely removed. Each time this command is used, a new backup of the current .ini file is created. Deletes the global custom .ini file. Display the content of the 'desc' key in the custom.ini file. Reloads all of the currently installed tracks' info and all "custom.ini" files included. List only custom tracks (shown in blue typeface). Hide original Re-Volt tracks (shown in red typeface). Display the hidden tracks (shown in gray typeface). Uses the name of the track (the comparaison is case-insensitive). Uses the track's folder creation date (allows to quickly see the last installed tracks). Uses the track's folder name. Enable/disable WolfR4 custom tracks support. Allows user tracks with Reverse info to be actually raced in Reverse mode. WolfR4 will monitor the user tracks with a "reversed" folder, to make them selectable in Reverse mode. Allows to have several Stunt tracks, instead of the single stock one. WolfR4 will detect Stunt levels when a file named "stunt.dat" exists in the track folder (just create an empty file an rename it "stunt.dat"). Now, if you select Stunt Arena mode, you will be able to select the track like in other racing modes (and only the Stunt tracks will be selectable in that mode). Moreover, user Stunt tracks will be properly hidden during the track selection in any other race modes, so they won't "pollute" the regular tracks list. And last but not least, the stars progression will be keep for each stunt track independently (in the "stunt.dat" file). WolfR4 will monitor the user tracks with a "stunt.dat" file, to make them selectable in Stunt mode. The "stunt.dat" file is also used to save the star progression for each track. To reset the progression for one track, replace its "stunt.dat" file with an empty one (it can be done directly from the contextual menu in the tracks list). Allows to add more Battle Tag tracks than the 4 stock ones included with Re-Volt. WolfR4 will detect Battle Tag levels when a file named "battle.ini" exists in the track folder (just create an empty file an rename it "battle.ini"). User Battle Tag tracks will be properly hidden during the track selection in any other race modes, so they won't "pollute" the regular tracks list. WolfR4 will monitor the user tracks with a "battle.ini" file, to make them selectable in Battle Tag mode. List all the tracks according to the Track list options. Shows the track name (read from the track .inf file). The track has a "reversed" folder. The track is a Battle Tag track. The track is a Stunt track. Several command are accessible when right-clicking on the track list. This track will be active when Re-Volt is launched. Opens the track main directory (inside the "levels" folder) in windows Explorer. Opens all the folders that contain some files used by the track in windows Explorer. It includes the main track's folder, the "gfx" folder if a gfx image is supplied, and the custom directory when it is used (the content of the custom.ini file is parsed to know that). Open the .inf file of the track in the associated application. Open the .ini file of the track in the associated application. Display the list of all files/folders used by the track in the WolfR4 Log. Will reduce the custom.ini file to the to the minimum needed, by removing all unused (ie. commented) lines and all empty sections in the custom.ini file of the selected tracks. It can be used for example before distributing a custom track. The 1st header (between the 2 "--- - ---" lines) is preserved. All other commented lines are definitely removed. Each time this command is used, a new backup of the current custom.ini file is created. Self-explanatory. The track will not be Custom anymore. Creates a "battle.ini" file in the selected track's folder. The track will now be detected as Battle Tag. Deletes the "battle.ini" file in the selected track's folder. The track will not be detected as Battle Tag anymore. Creates a "stunt.dat" file in the selected track's folder. The track will now be detected as Stunt track. The file content is not reset when it alredy exists. Deletes the "stunt.dat" file in the selected track's folder. The track will not be detected as Stunt track anymore. Clear the content of the "stunt.dat" file to reset the star progression of the selected tracks. Open the 'custom.ini' file used by the selected track. If this file doesn't already exist, a default one can be created directly in the track's folder. To make track customization a bit easier and faster, when a new custom.ini file is generated for a track you'll be asked for the custom folder name (Notice: the custom folder is the folder where you have to place the custom models for a track, usually it is placed itself inside the special '#' folder). The given custom folder path will directly be used in the generated custom.ini file (instead of the default '#\???? ?\' pattern). Enter a blank name or press the Esc Key to skip the creation of this folder. The custom folder name can't be more than 5 characters long. By using "Open 'custom.ini' file" button without any track selected, a default 'custom.ini' file can be created in the main Re-Volt directory. It allows to take a look at the current "custom.ini" available options. This file can also be copied in the "#" directory to be used as a global custom file. Automatically rename the track's folder and files. Create an archive of the selected track which can be distributed to others. 7-Zip is needed to enable the Track Packer feature. WolfR4 can work with either "7z.exe" or "7za.exe" (this file has to be placed inside the WolfR4/Re-Volt directory). If you have already installed 7-Zip on your system, copy the "7z.exe" and "7z.dll" files from the 7-Zip folder to the WolfR4/Re-Volt folder. Otherwise, download the Command Line Version of 7-Zip from this page, and place the "7za.exe" in the WolfR4/Re-Volt directory. Use the [...] button to select the directory where the archive file will be created. 7z could be much slower, but the compression ratio is quite more efficient than zip. Don't add any MP3 files to the track archive. MP3 files can be quite big, and are not necessarily essential for a track, so it's probably a good idea not to avoid including them in the track archive. When a track is hidden, its ".fin" file is renammed with extension ".fni". Delete any and all files used by the track. Deleted files can be restored from Recycle Bin this way. Display the bmp image associated with the track (in the "gfx" folder). You can double-click on the image to open the file in your default image viewer. This panel contains all of the bugfixes I wrote for Re-Volt. Unless you have some trouble with one of them, you could activate them all (in this case, using Win98 Comp. mode should be deprecated). Some of the bugs fixed here would appear only when running Re-Volt under Windows XP (or later: Vista, 7 and also maybe Win2K) without activating the Windows 98 (or 95) compatibility mode. Fixes crashes when loading some levels (eg. nhood1, wild_west2). Fixes crashes when loading some battle tag levels (eg. nhood1_battle, Muse_Bat). Fixes slowdown or hang during level or frontend loading screen. Should allow to have the loadlevel images and the track infos properly displayed during the loading of the track (without this patch, you may get only the blue frame with a black background). Fixes several inconsistencies in original sorting to have all user tracks properly displayed in alphabetical (case-insensitive) order. Fixes the bug when the host try to restart the same race in multiplayer. Re-Volt will now reload the track instead of displaying the error message "Host Started Game With Unknown Track!" to all clients..
Re-Volt won't crash anymore after a race session launched from a lobby client (like RVHouse). It should also prevent Re-Volt from crashing it is closed with Alt+F4 (of using the "Quit" button in WolfR4) during a lobby session. You should be able to join the next race after the host has started a track you don't own. Without this fix, Re-Volt uses to crash on some levels when a bomb is transmitted from one player to an other. I have not verified it yet in practice, but I think that when using this option, you should avoid to race with people who doesn't use WolfR4 (or have deactivated this option). This patch will prevents revolt from crashing when you add a lot of custom cars (roughly more than 60). Moreover, on the contrary to previous fix (like TMMCC), this patch also increases the list of user cars than can be selected by AI players (ie. the opponents managed by the computer). More precisely, the AI cars will be selected amongst the first 128 custom cars in the same category than the player's car (rookie, amateur, etc.). Normally, the default behavior of Re-Volt is far more limited, and just the few user cars at the top of the list can be selected by AI players (which means that a lot of user cars are just never selected). If you just have deleted some custom cars and you can't run Re-Volt because it crashes before car selection, try this button. It will reset the last used car entry in the registry. Prevents the flurry of splashes which occurs when a car splashes into water (on tracks that use multiple waterboxes). With this fix, it should be possible to use up to about 30 waterboxes per track. Sometime the startup "GO" signal reappears repeatedly during the race, and the race timer is reset to 0. It's a consequence of a too fast cpu clock (but it doesn't appears on all fast cpu). This fix should remove this bug, and it also increases Re-Volt's internal timer resolution. By the way, if you have a fast computer, I would recommend keeping V-Sync activated to get more consistent race timings. Enable this setting to fix an online timing issue when running Re-Volt on modern day multi-core and hyperthreaded CPUs (some CPUs are affected, some are not). When a player with this bug is racing online, its timing result at the end of the race will be totally inconsistent for all other player. It seems that this bug is often mixed up with the "GO GO" bug above. This fix is simply setting the processor affinity for the Re-Volt process (allowing it to run only on first cpu/core). Fixes bug when you use 'reposition car' just after 'flip car', where the next 'flip car' will reposition the car to the previous 'flip car' location. Prevents Re-Volt from recording a wrong ghost when you reposition your car during the first lap of your first attempt to beat the time trial. Fixes a bug probably introduced by Re-Volt patch v1207. Now if you close Re-Volt by using Alt+F4 keys, the Re-Volt process will be properly terminated. Amongst others things, this patch should prevent a windowed Re-Volt from eating all cpu power while its window is inactive. Shortcut to set the Windows 98 compatibility mode directly from WolfR4. 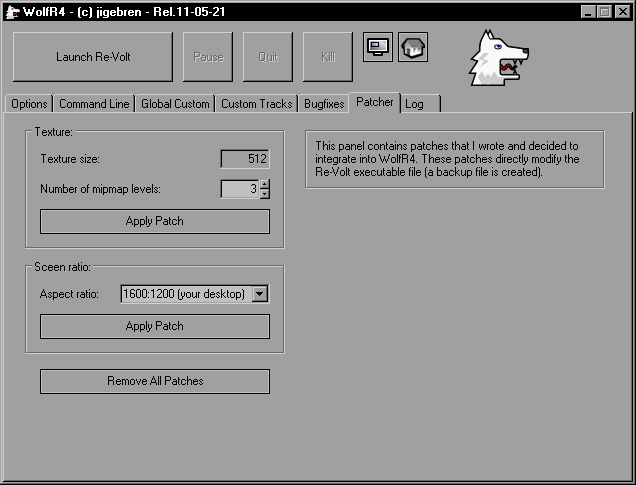 This panel contains patches that I wrote and decided to integrate into WolfR4. These patches directly modify the Re-Volt executable file (a backup file is created). Patch the Re-Volt executable file. The filename entered in the "Command Line" tab is used to select the file that will be patched. Restore the backup file as original file. All patches are removed. By default value, Re-Volt uses 256x256 pixels textures. If you try to use bigger textures files, the colors will look wrong (after some tries, I discovered that it is due to the used resizing method which is simply ANDing colors values, thus giving this inconsistent output). With this patch, Re-Volt will use 512x512 pixels textures. Mipmap images (.bmq files) are used to optimize the display of far objects. For each supplementary level of mipmap, the size of the image is halved (ie. 256x256 for the 1st level, 128x128 for the 2nd, 64x64 for the 3rd, and so on). The last letter of the file extension is linked to the mipmap level. For example, if you use 3 levels of mipmap, you should provide the usual .bmp and .bmq files, as well as a third image file, with a .bmr extension. Enter the aspect ratio of your screen, for example 16:10. You can also simply use the width and height of your screen separated by a colon ":", for example 1680:1050 (it will be automatically simplified when possible). Allows to use a different profile when WolfR4 is launched from a lobby client (profile switching is automatic). When this option is enabled, a new icon will appear in the toolbar (to indicate the current profile). By clicking on this icon, the Lobby profile can be manually enabled/disabled at any time. Restore all WolfR4 default settings (for the current profile only if you're using Profiles). Will not modify the settings that use to be saved in the registry. The last stable version of WolfR4 can always be found here. WolfR4 has been confirmed to run under Windows XP, Vista and 7 (and probably Win98 as well). It has also been reported to run under GNU/Linux using Wine (1.2 RC1). Of course, you need a working Re-Volt installation (with Patch 1207 applied). The minimum required screen resolution is 640x480. To enable MP3 playback, the "Mp3dec.asi" and proper MP3 files are needed. To enable CD music playback, an original Re-Volt CD is needed. Just extract the WolfR4.exe file from the downloaded archive into the main Re-Volt directory. If the download doesn't work after a recent update, refresh your browser's cache ([F5] keys for Mozilla browsers). This utility is released as freeware, and it is provided "AS IS" without any warranty. You are not allowed to redistribute this archive or any of the included files. The full changelog can be found inside the "WolfR4 - readme.txt" file supplied in the archive. 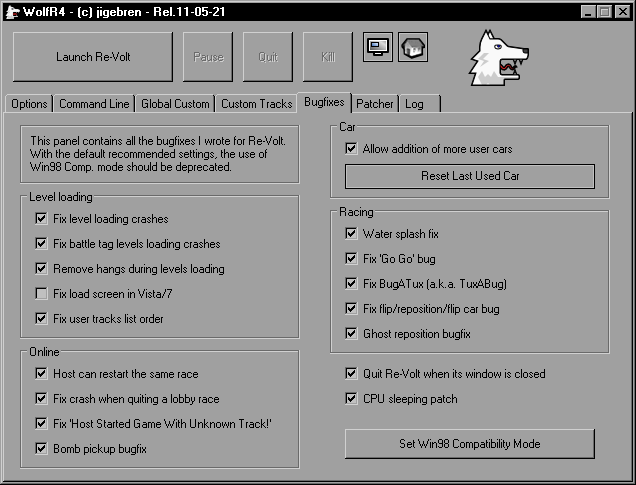 Lauch WolfR4.exe, set the options you want on the panels, and use the "Launch Re-Volt" button to start Re-Volt. A "Reading all tracks info..." message is displayed in the window title as long as WolfR4 is busy examining the tracks files. Don't close WolfR4 while Re-Volt is running (as it will close Re-Volt too). By default, Re-Volt is launched in windowed mode. You can switch to fullscreen mode in the "Command Line" tab. If you intend to play Re-Volt online with a lobby client like for example RVHouse, take a look here. Just delete the WolfR4.exe and the WolfR4.ini files. WolfR4 does not add or modify any entry into the Windows registry (except some keys also used by Re-Volt itself). If you want to try the MP3 feature, you can download this archive. It contains the Mp3dec.asi file needed to enable MP3 playing in Re-Volt, and two MP3 files. All these files come from the Re-Volt demo version. As a custom track example, you can try the custom Jailhouse Rock track (a very great track made by Human). To use this custom track, extract all files and folders in the Re-Volt directory and run Re-Volt from WolfR4. Note that the provided Custom.ini file contains a lot of unnecessary commented-out lines (left for information purpose only). You can take a look here at what should be the bare bones Custom.ini file, with only the header and the needed entries. Before asking for any feature, please check that it is not already in the TODO and the WONTDO lists. The best way to report a WolfR4 bug is to use the ORP forum (Our Revolt Pub). You'll have to register to post, but it's simple and free. There is a topic dedicated to the WolfR4 tool. If you don't feel like registering on a forum, or in case of extreme emergency ;) you can also send me an email (my address can be found in the WolfR4 readme.txt file). But please don't make me loose my time with messages like Help me, WolfR4 doesn't work for me , or I can't get blah-blah working !!! . If I don't have a clear description of what you're trying to do and about the issue you get, as well as some useful infos about your current configuration, I'll probably simply not anwser at all. Some stuff I'd like to do, or features that have been requested, but I'm not sure that can / will be done. Features that I'm aware of, but I won't / can't implement. Don't ask me to implement a feature that is allready in this list. In most case, it is not possible to increase any boundaries fixed in Re-Volt (there is several exemples in the list below), because the used memory areas are not allocated at runtime, they were fixed once for all in the binary file during the compilation process. It is not patchable, and would rather need the source code to be modified and recompiled. I can't increase the number of textures available for a track (10 textures). But notice that it is possible to increase textures quality. And once you've understood that using 10 512x512 textures is equivalent to using 40 256x256 textures, then you'll see that increasing the number of available textures is not really needed anymore. The maximum number of tracks can't be increased (to more than 256). The ENV polies number limit can't be increased (if you add to much of them, some will be rendered as regular polies). Fix the bug that prevents objects to be displayed in the frontend while returning from Makeitgood Object edit mode (it could be done, but it doesn't really worth the pain). Increase chat message length in Multiplayer (when you press F12). It could be done, but doing it nicely would probably involve to move the used memory zone, and it implies quite a lot of patches (not so much though). And I don't feel like doing it. Of course, if it appears to be a really wanted feature, I could change my mind.